Transmission Service at #4410 Pro Oil, 32471 Lougheed Hwy. Clean trans-fluid lubricates moving parts, dissipates heat and helps prevent wear and breakdown. The Pro Oil Change in Mission can complete a transmission service during your next visit. Additives in the fluid can deplete over time and many manufacturers recommend that it be replaced periodically. Replacing your transmission fluid and filter according to your vehicle manufacturer's recommendations helps preserve the life of the transmission and helps maintain your vehicle warranty. 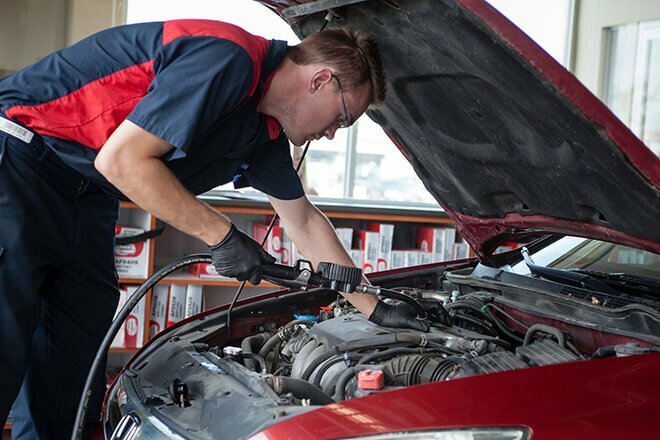 Transmission fluid service can help keep your car from overheating and help prevent delayed shifting and transmission failure. Also, proper maintenance of the transmission fluid helps to avoid expensive transmission repairs, prevents lock ups, allows your vehicle to run cleaner and improves your fuel economy.